Mitchel Cohen interviews Dr. Margaret Flowers and Kevin Zeese upon their return from a fact-finding trip to Venezuela, for WBAI/Pacifica radio. Flowers & Zeese report that almost everything that the U.S. government says about what’s going on in Venezuela is a lie, and give multiple examples of the truth, based on their own first-hand investigations there. Kevin Zeese is an attorney and Dr. Margaret Flowers is a pediatrician, who have now become full-time activist-journalists. They edit the daily internet magazine Popular Resistance and produce a well-known podcast show, Clearing the Fog, via the PopularResistance.org website. It hurts us to read and write about Venezuela today. A tyrannous troika of mendacity, ignorance and laziness rules with near impunity in the world of journalism: from Fox News to the BBC, from CNN to the Guardian, from Amnesty International to the Committee to Protect Journalists, from John Oliver to Jacobin Magazine. We would much prefer to write about how we have been moved to joy and courage and compassion by the mass popular democratic movements in this country. We would prefer to write about the sense of goodwill, hope and inspiration which emanates from the grassroots Venezuelan revolutionary process. As Che Guevara said, revolutionaries are guided by great feelings of love. As many other commentators have detailed, the self-proclaimed interim president Juan Guaido – for whom billions of dollars belonging to the Venezuelan people have been expropriated by US and British banks – is a virtually unknown figure in Venezuela,. He simply declared himself sovereign, not even during an election year, and not according to any law. The speed and shamelessness with which the leaders of so many countries have abandoned any pretense to democracy, in their official recognition of Guaido, is rather remarkable. But let’s start by clarifying that this rejection of representative democracy only currently afflicts a minority of the world. There is a strange phenomenon taking place in the international left media, in which leftish reporters seem to be getting all their news from the right. Even Amy Goodman stooped to this in an interview with Venezuelan foreign minister Jorge Arreaza, citing studies by the IMF and Human Rights Watch, each of which have a well-documented history of sowing chaos and counterinsurgency in Venezuela. But the prize for a leftwing newspaper with a rightwing research wing goes to Jacobin. “Maduro was not democratically elected,” proclaimed a recent article– a lazy lie which has been repeated about every single election in Venezuela since Chavez first came to power, despite extensive reports and denunciations of international observers. Phrases such as “the extent of popular power in Venezuela has diminished significantly in recent years” are published without a trace of evidence. In the hegemony of “human interest” journalism, personal anecdotes eclipse historical analysis, and no one seems to note the demonstrations of thousands of people in support of Maduro. It is a surreal situation in which the masses of working class Venezuelans are invisibilized in favor of solidarity with their simulacra. Here’s another gem from Jacobin: “Opposition to Maduro is now common not only among upper and middle classes (as it has been for some time), but also among the popular sectors. Polls indicate that most Venezuelans want Maduro out”. The claim is unsubstantiated in any way. Widely available videos and photos of opposition demonstrations reveal quite the opposite – they are lily white and racist to boot; they wave US and Israeli flags, and glorify Trump. And then a poll carried out by a think tank based in Washington DC is cited as an example of Venezuelan popular will! But perhaps it is folly to focus on this magazine which rejects the politics of its namesake, only to wind up as the loyal opposition to multicultural capitalism. Better to focus on other voices, which are taken more seriously on the international stage. 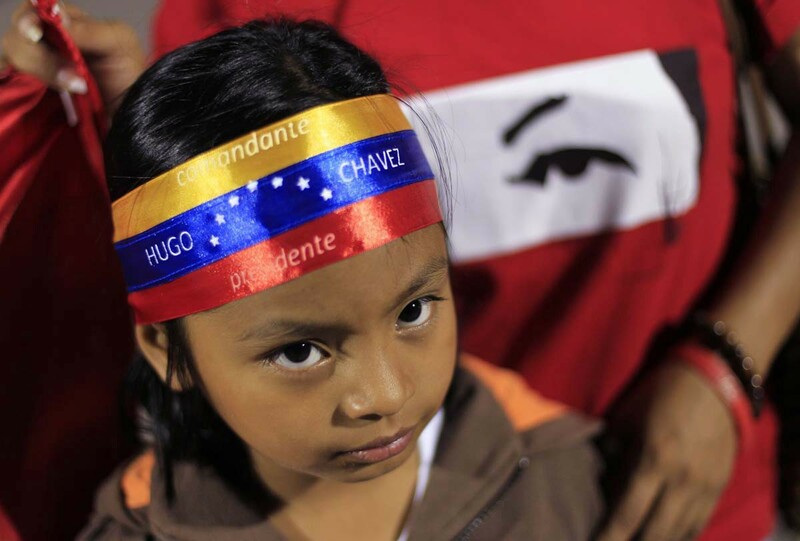 Let’s be clear – critiques of the bourgeois, colonial state and the political economy inherited by the Chavista regime are rich and diverse throughout the country; these critiques are articulated mostly by outspoken Chavistas, who very often quote Chavez and Maduro on this subject. But we have yet to encounter a grassroots mass movement which denounces the Maduro government as illegitimate or authoritarian. The accusation of “authoritarianism” in the name of international solidarity is odd alongside near-total silence about the constant killings of social movement leaders in neighboring countries, and especially odd when it comes from people who are citizens of countries that are engaged in systematic torture and outrageous war crimes. While authoritarianism can be diversely defined, we will not deign to denounce claims that the Venezuelan government is a dictatorship; the so-called radical critics are invited to consult a dictionary. The accusation of “authoritarianism” in the name of international solidarity is odd alongside near-total silence about the constant killings of social movement leaders in neighboring countries, and especially odd when it comes from people who are citizens of countries that are engaged in systematic torture and outrageous war crimes. We earnestly ask these radical anti-Chavistas what purpose do their words serve in the current conjuncture? With which grassroots movements are they concretely in solidarity? Do they write for foreign NGOs or for popular newspapers? Who benefits when ecosocialists like Lander stage meetings with proto-fascists like Guaido? These “radical critics” who are lionized abroad but have no significant popular support at home, appear to want to criticize their cake and eat it too; to live in a revolutionary process but criticize it from the academic sidelines. Meanwhile, for those anti-Chavista critics living in the United States, it is difficult to stomach the spectacle of their posturing: Good citizens of a ruthless empire which is actively working at every level to overthrow a foreign democratically elected government, who take it upon themselves to denounce that foreign government for not being “radical enough”. Who is not being radical enough, really? In this deeply complex and decisive historical moment, we share the humility of Lenin when he said: “I don’t know how radical you are, or how radical I am. I am certainly not radical enough. One can never be radical enough; that is, one must always try to be as radical as reality itself.” We too would like to witness the demolition of the bourgeois state, and the abandonment of the rentier petroleum and mining economies which are a legacy of colonialism. But we don’t believe a new mode of production can emerge by making demands and denunciations. We are not particularly outraged that Chavez and Maduro have failed to reverse 500 years of colonialism in a couple decades of a constitutional revolution. We struggle for solidarity with a path towards the future based on the realities of the world we live in today. Our 2015 proposal for the solarization of the Venezuelan economy and Mercosur (“An Ecosocialist Horizon for Venezuela; A Solar Communist Horizon for the World”) outlines such a proposal.